"....while we may find it convenient to regard it as a more primitive word for what we now term depression, the truth is much more complex. Having experienced both conditions, I think it likely that much of the restless boredom, frantic escapism, commitment phobia, and enervating despair that plagues us today is the ancient demon of acedia in modern dress. The boundaries between depression and acedia are notoriously fluid; at the risk of oversimplifying, I would suggest that while depression is an illness treatable by counseling and medication, acedia is a vice that is best countered by spiritual practice and the discipline of prayer. At its Greek root, the word acedia means the absence of care. The person afflicted by acedia refuses to care or is incapable of doing so. 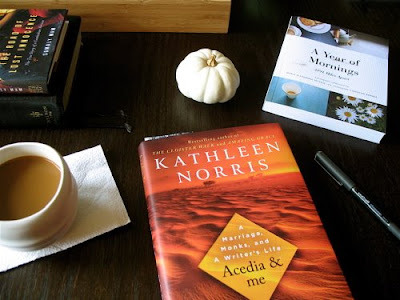 When life becomes too challenging and engagement with others too demanding, acedia offers a kind of spiritual morphine: you know the pain is there, yet can't rouse yourself to give a damn. That it hurts to care is borne out in etymology, for care derives from an Indo-European word meaning 'to cry out,' as in a lament. Caring is not passive, but an assertion that no matter how strained and messy our relationships can be, it is worth something to be present, with others, doing our small part. Care is also required for the daily routines that acedia would have us suppress or deny as meaningless repetition or too much bother." She does not share my reformed theology, but her combination of memoir and spiritual writing has inspired me ever since I read The Cloister Walk in my tiny studio apartment behind Empire Cafe several years ago (before marriage). As a writer, I study her craft closely - she has a way with words like none other and thinks about topics that no one else does (by the way, I was pretty geeked up to hear this author speak at an IMAGE conference in Houston a few years ago. As the closing speaker one night, she discussed how our culture often slaughters language and read some of her favorite poems as lullabies). In the above passage, Norris intimates that acedia can pop up when life is more taxing that one would prefer. I'll second that. As I've wrestled with health issues, there were numerous times when I thought, "Who cares anymore? This is my life now - to feel wretched. Yeast toxins have taken over." Except that deep in my injured soul, I knew God had revealed otherwise. That still, small Voice reminded me, "No. I am healing you." This exchange occurred again recently and after reading the above passage I thought, "You know what? It's acedia! I do care. I'm not giving up. My [annoying] medicinal regimen is worth it. Even this illness is for a good purpose." It is not coincidental that acedia slithers in when I've let the pondering of Scripture slip behind books and other reading; when my prayers are halfhearted wisps though I need to cry out. [regarding her mother's instruction make her bed as a teenager] "To me, the act was stupid repetition; to my mother, it was a meaningful act of hospitality to oneself, and a humble acknowledgment of our creaturely need to make and remake our daily environments. 'You will feel better,' she said, 'if you come home to an orderly room.' She was far wiser than I, but I didn't comprehend that for many years. Neither of us could see that I was on my way to becoming a cerebral disaster zone." We are created to make and remake and I love the idea that hospitality is not only a gift to extend outward, but also inward - to my husband, to the cats, and to our future children (and then they will give hospitality to me and Johnny. Or else.) This really got me to thinking as I looked around our house the past few days. When one or the other spouse is ill, letting a few chores slide is inevitable and not slothful at all. There are times when survival is more important than a model home. But I've recognized that while I'm still somewhat sick, I am also improving and must gradually transition back to "healthy behavior." I often feel better when I do that extra load of laundry, make the sinkful of dishes disappear (with pear-scented dish soap), dust the window sills, or clean the stove top vs. procrastinating or settling into self-pity. Heck, I even decided to start making our platform bed. If you must know, we never make our bed, but the past two weeks I've simply pulled up the bedspread, straightened the pillows, and whaddya know, Kathleen Norris' mom was right. Lord knows what'll happen if I make the bed Martha Stewart-style. Well, I'll never live up to Ms. Stewart's standards - there are too many good books in the world - but as I pray for God to heal our home, I'm inspired to employ the work of my hands. Bring beauty and order to each room. Cook more creative meals. Use the microwave less; heat leftovers in the oven. Learn to garden. Relearn habits that I want to teach our children. Be thankful for my health as is and the ability to accomplish household tasks. ....Now I'm sitting in my rocking chair by the big window in our sky blue bedroom, the last of my morning coffee + chicory on the window sill. Today is quite a sight. We're carving a family tradition of daily neighborhood walks; the sunshine a good ole natural dose of vitamin D. And I'll have you know, I possibly discovered evidence that chicory is beneficial to my health - driving out yeast toxins, in fact. I'm still researching, but very encouraged. Chicory is in a few tea bags in our pantry, too. Lastly, I'm also reading "Meeting Marilynne Robinson" today. More Intelligent Life looks to be a regular online visit for me. This is a lovely post. Thank you for writing it; it gives me much to ponder. And a new book to seek out! I have been lurking on your blog for a few months now (that sounds more ominous than it is), and can no longer remember how I stumbled across it (a blog link led to a blog link led to a blog link, presumably), but I very much enjoy reading. i can not wait to pick up this book! i remember your other post about the cloister walk and wanted to read that one. i'll have to order them on amazon.com or something. i've had a heap of medical bills to pay this month... i totally understand all the medical stuff. i'm slowly healing too. this new medicine makes me very sleepy all day and my muscles sore, but i had a good nights rest last night. i guess it is worth it then! I think you both would love this book and Norris' other writings. I have Acedia & Me on hold at the library. You reminded me that I need to go pick it up. I read Cloister Walk and Dakota a few years ago and recently read Laundry, Liturgy & Women's Work. Love it all. I'm glad I have someone whose reading recommendations are so reliable! From my limited understanding of "acedia," I'd say that children are a sure cure for it. You can't escape the daily chores if you have to take care of the littlest, and in doing so you find so many ways to enjoy the day to day. Andrea, I'm happy to hear of that cure for acedia, and I imagine you're exactly right. I shall know one day. P.S. ~ I will answer your e-mail soon!